What's In It Wednesday - Another Round of "Is it Vegan?" Ingredients: Olive Oil, Coconut Oil, Shea Butter, Cocoa Butter, Jojoba Oil, Glycerin, Castor Oil, Water, Honey, Sweet Almond Oil, Potassium Hydroxide (for saponification), and Essential Oils. Loaded with antioxidants and several vitamins naturally enclosed in the best quality butter and oils, combined with local raw beeswax to seal moisture! No Chemicals, No Parabens, No Synthetic Colors. They come in an easy to use tub srink wrapped for your protecction!!! Peppermint Essential Oil -- Organic"
Because we know nothing says VEGAN like beeswax! "All Natural Handmade Cold Process Natural Vegan Goat Milk Soap"
Let's see--milk. Not vegan. Something from a goat (like its milk)? Not vegan. "All of our products are created with love on our Ohio farm. Our soaps are formulated to create lots of fluffy, cleansing lather. Using a bath pouf will intensify the lather. You will leave the bath feeling clean, soft, and refreshed. 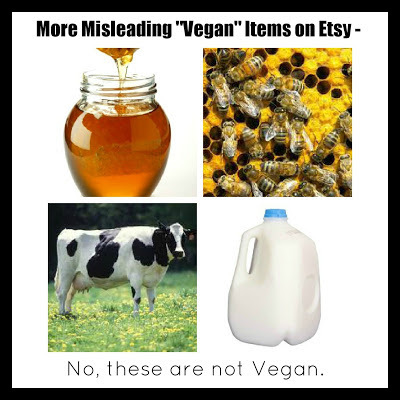 All of our soaps are vegan and contain do not contain “ANY” animal products. We use only the finest sustainable and organic oils and natural additives. We support sustainable, organic, and fair trade practices. All bars weigh between 4.5 – 5.5 ounces. Each order is for one bar of soap unless otherwise specified. Ingredients: Sustainable palm oil, organic coconut oil, organic olive oil, organic canola oil , organic Shea butter, organic beeswax, honey, milk solids, distilled water, sodium hydroxide, fragrance, and mica." Beeswax? Not vegan. Honey? Not vegan. Milk solids? Not vegan. Chic & Green says: This issue is just one of many right now that is going on with several dozen Etsy sellers, if not more. In addition to all of the erroneous health & skincare claims, as well as formulation issues, calling products VEGAN when they are not is a big deal. I am not a Vegan. I have many friends who are--and I was for a couple of months last year. It is a big deal to purchase a Vegan product only to find out that there are very NON-VEGAN ingredients in it.